Nestled in the confines of a massive warehouse, amongst various art installations and activities, lay the interior walls ofMana, a club/art mecca of the Art Basel scene. The path leading up to the venue was lined with a myriad of food trucks, for anypre-show picnicking pleasure. 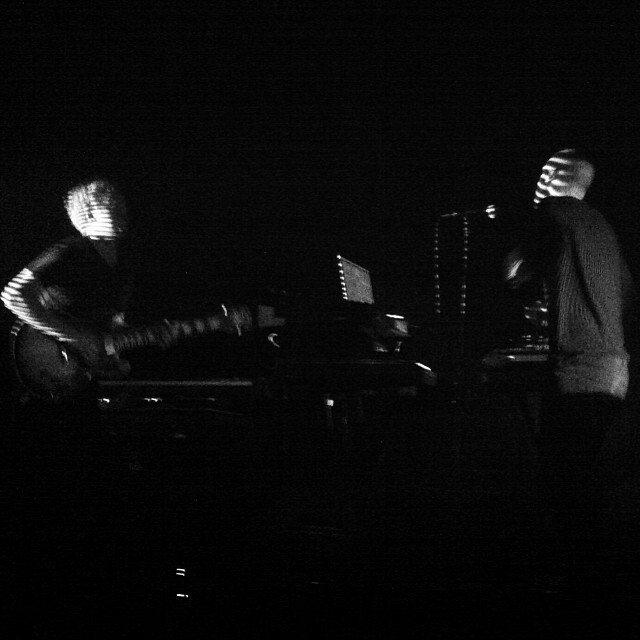 Thursday night at Mana proved to be a popular one, with Nicolas Jaar and Dave Harrington’s project DARKSIDE. DARKSIDE went on around 1am, on a stage that was aptly dark. This aesthetic was great for the type of music they put out, however the room was so large, and so dark, that at times it was a little frustrating. Starting out near to the stage, I was inundated with loud people, people arguing, people squeezing by me, and everyone just being generally unpleasant. It was only when I moved out of the crowd that I was able to exercise my space and gain a little ground for dancing, and so it began. Their set kicked off with a song that sounded much influenced by Pink Floyd. I was hearing “Welcome to the Machine” and “Another Brick In the Wall” simultaneously. Soon after they played around with these sounds, they dropped into a deep pounding bass with a tripped out synth, drawing out imaginarywires of sound. This was great dance music, however it was a tease. The interplay between four to the floor dance music and progressive, interpretive post-rock blues started a war within my mind and body. I wanted to dance, yet all of a sudden the music would tell me I could not dance, only listen and think. Then the music would steer me to dance again, only to be let down with another lull of dark, instrumental narcotics. It got to the point where I was too hesitant to dance, because it was like musical chairs. This stop and start of music continuity was very frustrating to me, and many others around me. I am not the only one who noticed this and had a complaint about it. It felt almost selfish and controlling of DARKSIDE to be playing this way, in the sense that it was beginning to feel like a game of Simon Says, only with music as the cue. It would have been nice if they layered the more mundane music on top of the dance music, to see where they could take it. That would have been more risky, more interesting. Their set was only an hour long, and they were over by 2am. Normally I would call shenanigans on an hour set for something of this grandeur, but I was actually a bit relieved; I wasn’t sure how much longer I could sit through the push and pull of their music holding patterns. All criticism aside, It was a pleasure to see Nicolas Jaar perform live, with his airy sound and vocals paired with Dave Harrington’s blues toned guitar. DARKSIDE does have a great quality to them; however I think they need to hone their live performance into something a little more accessible. This is not to say they are not talented, or that they don’t have a good thing going… they have a wonderful thing going. I just think it needs a little more exploration, and a little more verve. Til next time, DARKSIDE.